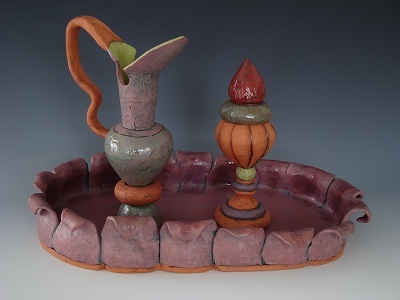 JoAnn Schnabel is a Professor of Ceramics at The University of Northern Iowa in Cedar Falls. In my current artwork I have had a continued interest in working with clay to express its unique qualities as a material. In these most recent pieces this interest has taken two distinct paths: working off the wall within a modular format and making ceramic objects that reference the vessel tradition. In both these works I am carving the clay to accentuate their forms, which are abstracted from nature, and using richly glazed textures to emphasize the relationship between form and surface.